To clarify, I’d barely run since July and live 150 miles south of Tom. But there wasn’t any hesitation “wasnt planning on but im interested.” And so, less than 48 hrs later, after hitting the road at 5AM, I was making my way to the Dales with Tom. I’d visited the 3 Peaks for last years Race and have been intrigued by the route, its profile and challenge ever since. 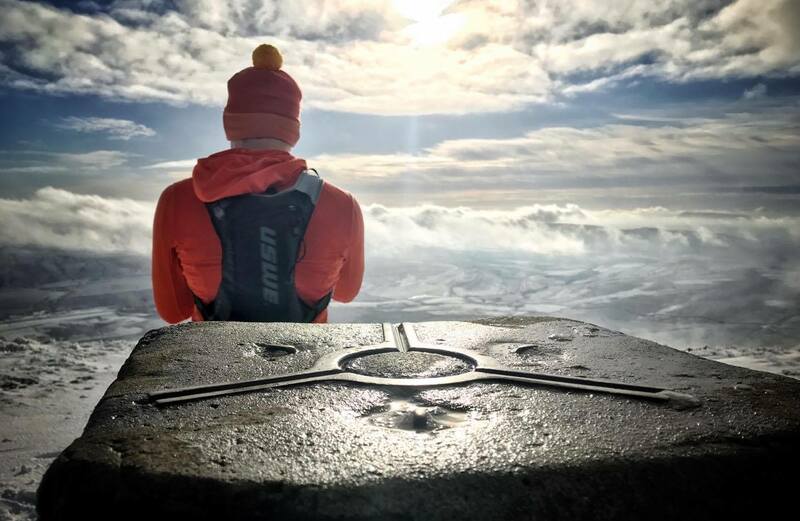 The 3 Peaks are made up of Pen-Y-Gent, Whernside and Ingleborough, providing elevation many runners would expect only possible in the Lakes, Wales or Scotland. 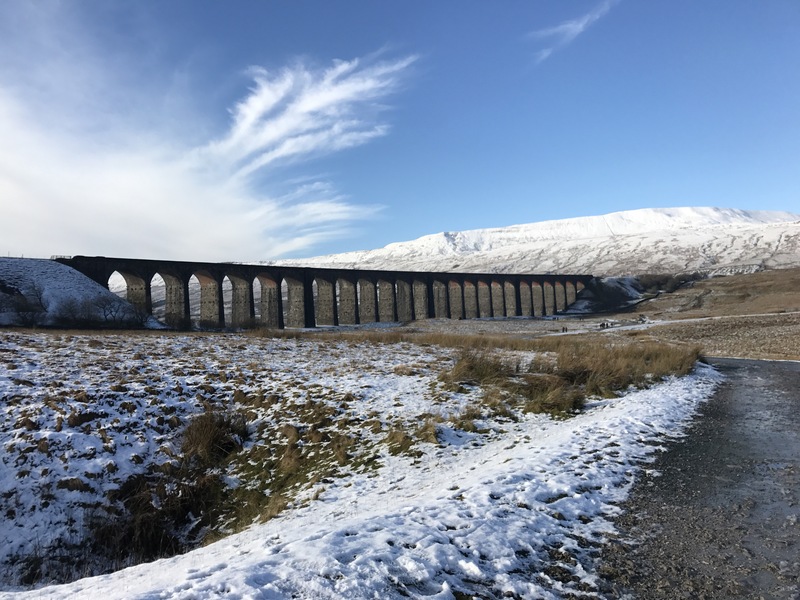 Starting in the village of Horton in Ribblesdale, we made up way up farm tracks, out of the base of the valley and onto the surrounding slopes. Our route, wouldn’t follow the exact race course and given the conditions I was more than happy to take a longer route. 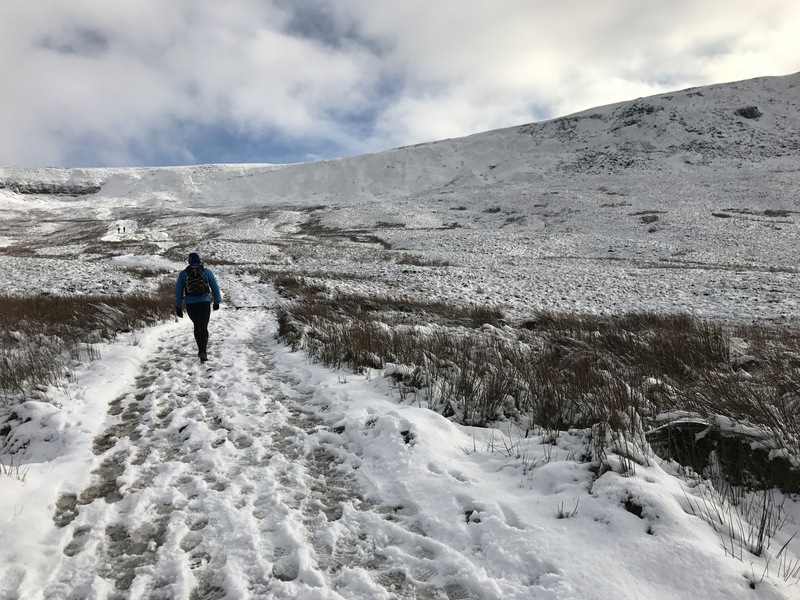 Snow covered the 3 peaks, with the valley saturated in water, following the thaw; mud and standing water littered the trail. Hitting snow for the first time in a year, the feeling of air pockets compressing beneath my feet refreshing and something scarce of opportunity in the south. The hills were full of walkers, making the most of the good weather. The forecast had stated low cloud and rain. The run between Pen-Y-Ghent and Whernside is deceptive. Despite looking relatively close, the miles racked up, navigating through fields, country roads and past the Ribbleshead Viaduct. It was shortly after, as we ascended the flank of Whernside we both wished we’d brought Micro Spikes or Yak Trax. 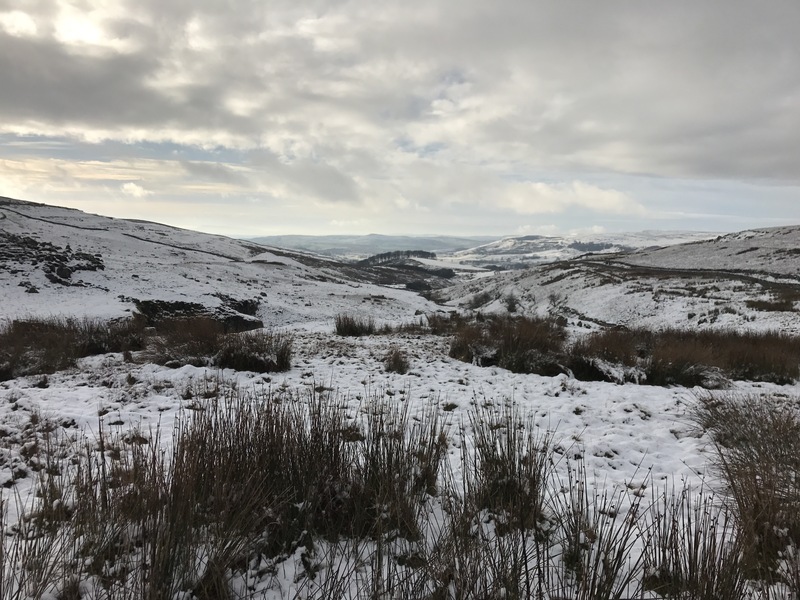 The path had much greater footfall than we had encountered up to this point, and with it the trodden snow had frozen into layers of ice. Walking was safer and easier. The cloud had come in, covering the summit, whilst shards of lights attempted to burn through. As the ground levelled out, the cloud rapidly burnt off, opening the vistas as we made our way to the trig point. In the distance, the outline of Ingleborough was present, with an ominous layer of cloud encapsulating the summit ridge. And here is where my legs decided truly fell off. Without any real hills in half a year, the flagstones which made up the majority of the route to the valley floor punished me. The shocks reverberating through my quads, I had to ease off, while Tom flew into the distance, routinely stopping for me to catch up. Knowing what layahead, I was happy to try preserve my legs for the latter third. Making it back to the roads, we veered off past a pub and onto the final run to the base of Ingleborough. It was on this section that a woman stood idle, whistling at her dog, while it chased a sheep over a small crag. Despite being infuriated, I couldn’t pluck up the courage to make a point. Confrontation isn’t my strong point. At this point, its interesting how perspective can make or break a photo. Below are two shots, on the same piece of bridge, taken within a minute of each other. The first mine of Tom, facing the mountain, the second by Tom at the end of the bridge, looking out to Whernside. It’s incredible how different they can be. And so it began. In the shadow of the cloud and with winds picking up, the temperature dropped rapidly as we snaked up the steep track. On the ridge, conditions deteriorated, visibility dropped and getting up and down was a priority. That and the day light was rapidly reducing. Pushing for the trig point, it was another land. Two clear summits were in stark contrast to the featureless white out we now experienced. Tom briefly stopped at the Trig Point for a photo, retracing our steps would be a lot harder. Horton was 3 miles away and the ground was a combination of flag stones, mud and limestone pavement. Bearing in mind this was the descent for the race, I found it hard to imagine hammering down, close to blowing up, while navigating the sketchy terrain. Remember, the race is in April and it often has a coating of snow. My legs were beat, quads completely smashed and my energy levels dropping. Two handfuls of Tom’s trail mix gave the sugar rush I craved. 25.8 miles, 6 hours and 1600 odd meters of ascent/descent. We weren’t going to break any records and took plenty of time to chat and capture content. It may have been well beyond what was comfortable, but it was great to be back out in the hills and reacquainted with Tom. Now, to get fit enough for the race. 2018?